Nestled in a lush Caribbean garden resplendent with fruit trees and meandering stone pathways that lead to secluded Nail Bay Beach, this Virgin Gorda villa exudes five-star quality without the five-star price tag. The Sunset Watch Upper Villa is best known for the spectacular views it commands from its expansive wrap around deck and the hammock from which to enjoy them from. 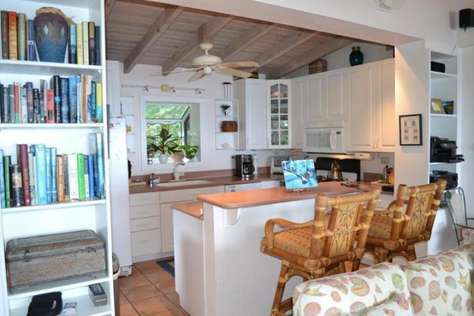 Amenities include a gourmet equipped kitchen, outdoor shower (with views of the Dogs), wifi, satellite tv, and an iPad equipped with thousands of tunes, movies and island exploration ideas. 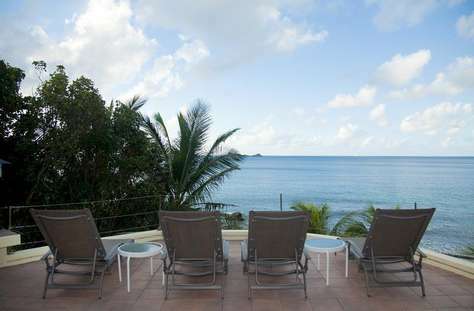 Enjoy the semi private pool, walk down the steps to secluded Nail Bay Beach, or do both! The Sunset Watch Upper Level Villa is the perfect place to relax, recover, charge your batteries, and soak in the spectacular sunsets each night. Sunset Watch Poolside may be partnered with Sunset Watch Upper for 2 private and unique bedrooms which share a common pool and patio. Why dine out when you can prepare the perfect meal for two in your own private kitchen or barbecue out of doors on the patio. Nature’s finest is your backdrop as you take breakfast, lunch or dinner on the patio, the nearby sun deck or even right on the beach below! Sunset Watch’s Lower 1-bedroom also features an atrium den for relaxing after the day’s adventures, catching up on your reading or a private chat. 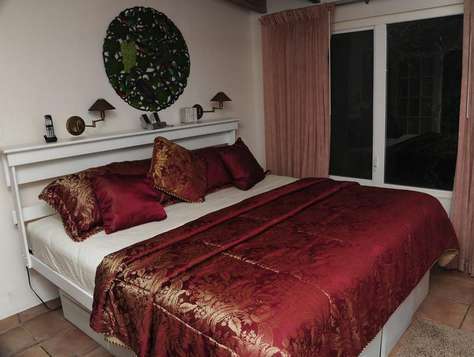 The king bedroom is outfitted with quality linens and rests beneath a hand-painted mural. Your patio is just beyond the glass sliders in the bedroom area - the beautiful blue sea and an array of islands will be your supreme view. Luxury extends to the bathroom with its double vanity, Jacuzzi with shower, outdoor spa shower and white tiled floor.